Located within the Geology-Mathematics-Physics (GMP) Library, 240 Braunstein Hall, the Visualization Laboratory (Viz Lab) offers a suite of research services focused on data science, analysis and visualization. Operated as one of the services provided by the UC Libraries’ Research and Data Services (RDS) unit, a primary goal of the Viz Lab is to engage with the UC community to continually improve teaching and research outcomes by providing a high-tech and collaborative working environment.The Viz Lab is open to users at any research level, including undergraduate students, graduate students, post-docs, staff and faculty across all disciplines and departments. The Viz Lab is designed as a modern take on the traditional instructional and research space. The Lab is outfitted with two high-end workstations (one Mac and one PC) connected to an eight-screen (4K resolution) display wall. Output is multi-modal, and users can choose from a one-input full screen (4×2), a two-input split screen (2- 2×2) or a five-input split screen (1- 2×2 & 4- 1×1). When not in dedicated use, the Viz Lab is available to students and researchers as an enclosed quiet study space. During spring semester 2019, two geology courses are being taught in the Viz Lab. These courses take advantage of the Lab’s unique features, including the ability to connect an HDMI-enabled digital microscope for side-by-side display of samples alongside lecture materials. In addition, the Lab has also had early uses for department meeting and presentations, library technical workshops and web conferences utilizing the Lab’s video equipment. Richard Johansen is the data visualization specialist in the RDS unit and has worked at UC Libraries since April 2018. He manages the Visualization Laboratory and the Data & GIS Collab, two research labs located in the GMP Library. Richard serves as a technical consultant to faculty and students on interdisciplinary research projects and teaches diverse workshops on topics including data analysis, visualization and open-source tools. 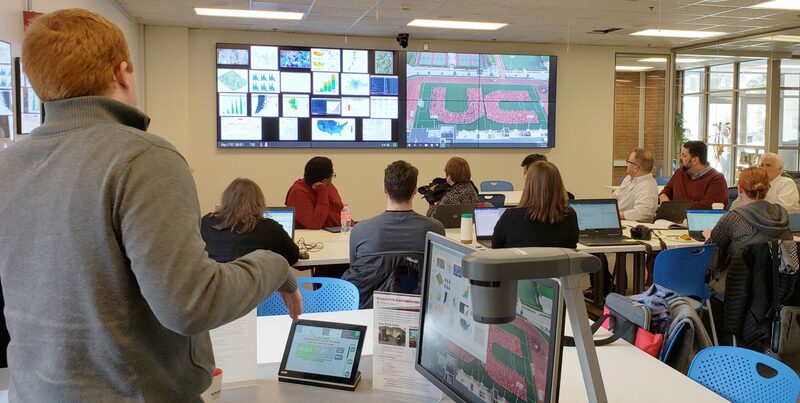 The Viz Lab is supported by a Provost’s Technology Innovation Award funding visualization technology that enables faculty and students to communicate knowledge in graphical forms. The Viz Lab offers consultations by appointment. To reserve the Viz Lab, email AskData@uc.edu. Additional information on RDS and the Viz Lab can be found online at https://guides.libraries.uc.edu/gmp-research-labs.